Krzysztof Heksel, polski malarz, pochodzący z Wałbrzycha (Dolny Śląsk). Urodzony w 1982 roku. Od dzieciństwa do chwili obecnej związany ze swoim miastem i tam tworzący. Jego twórczość można wpisać w nurt surrealizmu. Krzysztof zainteresował się sztuką już jako dziecko, ale dopiero pod wpływem ojca, który również tworzył, zaczął rozwijać swój talent. Przez długie lata malował obrazy hobbystycznie, dopiero w 2013 roku postanowił pokazać je na pierwszych wystawach. W krótkim czasie został doceniony przez odbiorców i kolekcjonerów sztuki na tyle, by zająć się swoją twórczością zawodowo. Mimo nieposiadania artystycznego wykształcenia, w marcu 2015 roku przyjęto go do Związku Artystów Plastyków. Styl oraz technika, w której obecnie maluje, dojrzewała przez lata prób i doświadczeń z różnymi materiałami i podłożami malarskimi. Obrazy Krzysztofa Heksla powstają na płytach, malowane olejami, wymagającą techniką laserunku – najlepiej oddającą głębię i efekty barwne światów, które przedstawia autor. Tematyka prac skupia się głównie wokół entropii, przemijania, śmierci, marzeń sennych. Może wywoływać skrajne odczucia u odbiorców, ale nie jest tak mroczna, jakby mogło się początkowo wydawać. 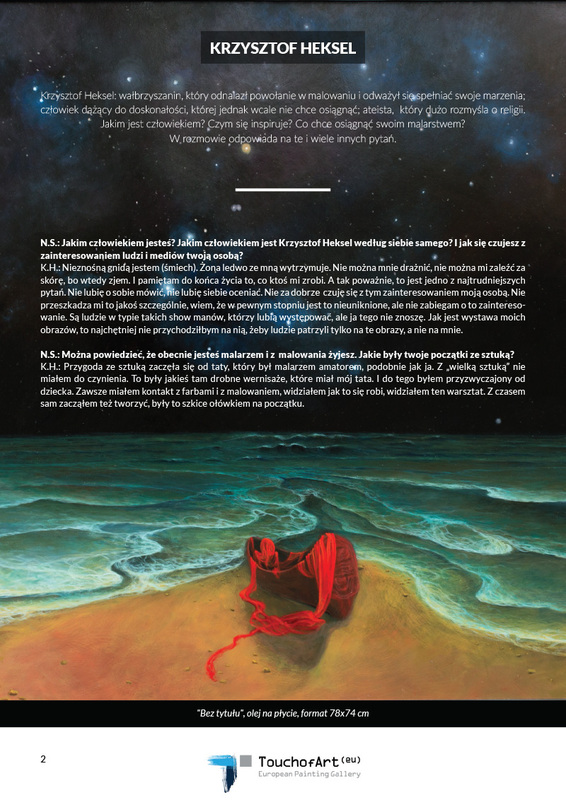 Inspiracją dla artysty jest świat, który go otacza oraz jego zainteresowania: kosmos, astronomia, filozofia i szeroko pojęte poszukiwanie sensu istnienia. Artysta nie tytułuje swoich dzieł. Nie chce narzucać odbiorcom drogi do ich interpretacji. Jednak ciągle nie ustaje w próbach udoskonalania swojej techniki malarskiej. Pod tym względem, jak sam mówi: „dąży do doskonałości, której nie chce osiągnąć”, bo interesuje go sam proces rozwoju. 2017 luty - "Metamorfoza", Gdańsk, Włocławek, Kołobrzeg, Wrocław - wystawa zbiorowa prac polskich artystów z nurtu surrealizmu i realizmu magiczneg. Krzysztof Heksel: an artist from Wałbrzych who found his calling as a painter and dared to follow his dreams; a man who strives for perfection but doesn’t really want to attain it; an atheist who often reflects on religion. What kind of man he is? What inspires him? What does he hope to achieve with his paintings? In this interview he answers these and many other questions. N.S. : What kind of man are you? What kind of man does Krzysztof Heksel consider himself? And how does it feel like to draw the attention of both people and the media? K.H. : An insufferable scoundrel I am (laughs). My wife is having a hard time putting up with me. I mustn’t be annoyed and you shouldn’t get in my hair or I’ll eat you. And when somebody crosses me, I’ll indefinitely hold it against him. On a more serious note, this is one of the most difficult questions. I don’t like to talk about myself, I don’t like to judge myself. And I’m not especially comfortable with being in a spotlight. It doesn’t bother me all that much and I do realize that, to some extent, it is inevitable, but I don’t really seek attention. There are showman-type people out there, who love to perform, while I personally hate it. When there’s an exhibition of my paintings, I’d rather not be there at all, so that people can look at my paintings only and not at me. N.S. : You can now say you are a painter and make a living as one. But how did it all begin? K.H. : My experience with art began with my dad, who was an amateur painter, just like me. This wasn’t some “big art” though, just some humble vernissages of my dad’s works. And that was something I got used to in my early years. Paints and painting were always present in my life, I’ve seen the way it is done, I’ve observed the techniques. With time I myself began to create such works and at first these were pencil sketches. N.S. : Was your father eager to teach you painting? K.H. : It varied. These were quite difficult times. But he even had a sort of manager who used his contacts to access different collections and catalogs containing miscellaneous works, eg. those of classical master painters. He even used to provide my dad with various paints, like acrylic paint, and as my father had no use for this particular type, I was allowed to create my first works with these professional paints. I must have been 13 or 14 when I got my first oil colors. N.S. : The ship at sea – was this one of your first paintings? You still have it after all these years. K.H. : It is one of many, that I painted back then. They were made using entirely different technique than the one I utilize today. My current method is based on placing many layers, constant altering, reimagining. The painting process is also a study of the work in the making. I repeatedly rework each of my works, I correct it and it takes a lot of time. In the past I have painted just like my father taught me – in a traditional way. Besides, I have only used canvas back then, I just wasn’t aware of any alternative. N.S. : Did you manage to sell anything at this early stage? K.H. : I’ve always managed to sell something somehow. To be honest, I didn’t always have it easy. There were times, possibly in 1985 or 1986 and perhaps a little earlier, when we had everything, we had money, dollars. My father even had a safe made to stash it as it was popular back then to have a wall safe hidden behind a painting. My father had a full-time job and at the same time worked on his paintings. While the shelves in the stores were empty, we had oranges, bananas... like some gentlefolks living large. But then due to some revaluations this money became worthless. Anyhow, I was raised to go to work and start earning money early thus I didn’t plan on getting an education. I might have been willing to go to an art school but this was not my focus. And even though I didn’t get a higher education, I know a few things about art and I have learned it all through practice. But above all I have always been lazy and, like a cat, I have always followed my own paths. N.S. : As for your technique, do you use anything besides glaze and panels? Why do you prefer this technique? K.H. : My father painted solely on canvas. I wasn’t fond of this canvas that was so responsive. You can’t apply pressure in fear of creating recesses, it’s simply too fragile. And I was fixated on making things that are sturdy. I remember when there were four of us living together and we would run around and sometimes accidentally one of us would scratch the painting or put a finger on it which would result in panic and desperate attempts to fix the damage. I never got used to painting on canvas – you can always see the texture. Plates allow you to get a smooth surface, from the beginning while priming and laying the paint. From a technological point of view, panels are superior. 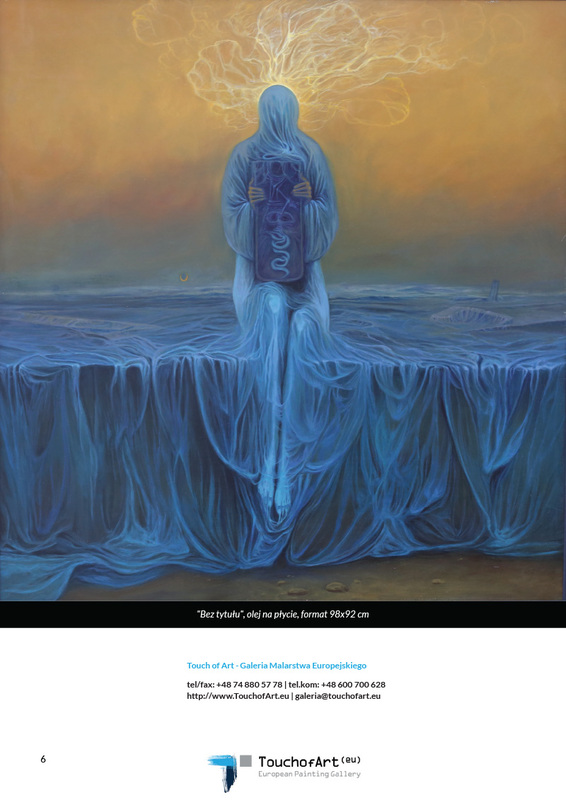 Secondly, I’m not a panel painting forerunner and neither was Beksiński. Medieval painters used panels of wood in their work so it’s hardly something new. N.S. 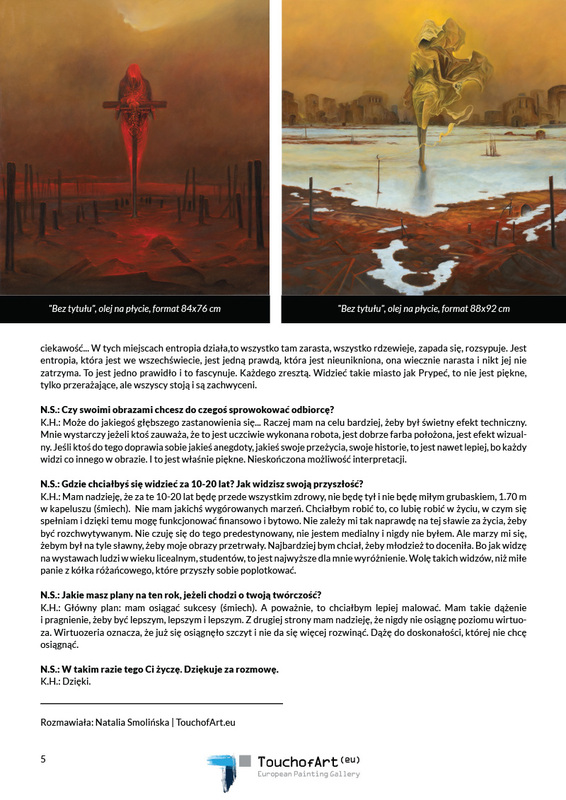 : It’s difficult not to spot resemblances between your works and those of Zdzisław Beksiński. But you don’t like being compared to him. K.H. : I don’t. I don’t want to and I don’t intend to be the kind of painter who copies works of others. But copying is an entirely different thing, a matter to discuss another time. I am definitely inspired by him, there’s no avoiding that. The resemblances are present in terms of subject, common themes, asking the same kind of questions. The similarity results also from utilizing the same technique, glaze. And why would I avoid this technique? This is nothing new even if it’s widely associated with Beksiński. But if someone paints similarly to Salvador Dali, eg. a giraffe that casts a beautiful shadow on a smooth sandy surface, then you could go and say that this is the way Salvador painted his works. And nobody’s outraged even though this is a well-known artist. The glaze that I use isn’t your typical method as with it the possibilities are endless. You never know when you should stop painting and when the work is complete. You can expand the tiniest detail and create something fun from it, rework it over and over again. This is exactly what attracts me in this technique, this and the resulting effect. N.S. : You state that you used to draw inspiration from the works of artists such as Aivazovsky, Bosch, Turner. What did you find so impressive in their paintings? What did you borrow for your own works? K.H. : As I mentioned earlier, I had an easy access to a pile of catalogs containing works of these classic artists. Bosch – maybe it’s because of the themes he explored and all of the “stories” that you can see in his paintings, all the intriguing tales, showing a man in his futility, revealing human stupidity. As for Turner, I value his technique. I love his landscapes, color blur, creating light effects, this method that gives you an impression that he is painting behind a fog. This is something great. Traditionally created using a great technique. I would like to paint like that, I’m trying to mimic that style. And Ivan Aivazovsky enchanted me with the way he painted the sea. Similarly, it’s about this blur effect, combination of light and color and how the sea is becoming one with the sky. And all of these ships, half-sunken, marvelous. I studied them by making a sketch and copying them as accurately as possible. And this way I have probably improved my technique and precision. Nowadays I can’t afford to leave a painting unfinished and I’m often displeased with the result, sometimes I’m running out of time or strength to finish a particular work because I have already spent a week or two on it and I can’t stand looking at it anymore... I think I’m a perfectionist in what I do. N.S. : And does anything inspire you beyond the paintings? Is there anybody who you consider your role model? What I mean is something that influences your philosophy. K.H. : My philosophy is nothing more than searching for the meaning of life. I grew up with books and I have always been interested in the universe. I still watch the stars with a sense of longing and I feel somehow drawn by them, as if I was homesick. As if my home was up there and not here, below the stars. N.S. : So you constantly feel out of place in this world? In such places entropy causes everything to overgrow, corrode, collapse and scatter. There is an entropy present in the universe and that is the only truth, that’s inevitable, it always grows and no one will ever stop it. This is the one rule and it’s fascinating. To anyone. To see a town like Pripyat is to behold something that’s not beautiful but terrifying and yet everyone stands there and watch it in amazement. N.S. : Are you attempting to somehow provoke people with your paintings? K.H. : Perhaps I want them to reflect upon it... But I’m more focused on getting a great technical effect. It would suffice if somebody recognized a decent job, well-painted, with a nice visual effect. If someone adds a story to it, personal experiences, a theme for the work, that’s even better because no two people will see the same things in a single painting. And that’s what’s beautiful. An infinite number of possible interpretations. N.S. : Where do you see yourself in 10 or 20 years? How do you see your future? K.H. : My main hope is that in 10 or 20 years I will be healthy, I won’t be gaining weight and I won’t become a nice stout fellow 5'7'' tall in a hat (laughs). I don’t have any unreasonable dreams. I would like to do what makes me happy, fulfilled and gives me financial and existential stability. I don’t really care for being famous in my life, I don’t crave popularity. I just don’t feel predestined to it, I’m not a media person and I never was. But I dream of becoming famous enough for my paintings to survive. I would be happy if young people appreciated my works. Whenever I see high school teenagers or college students at my exhibitions, I truly feel honored. This is my audience of choice rather than a group of nice ladies who stopped by for a chit-chat on their way from church. N.S. : What are your plans for this year as far as painting is concerned? N.S. : Then that is what I wish for you. Thank you for the interview. Pierwszy obraz sprzedałem mając o koło 14 lat. Był pewnie wzorowany na Ivanie Aivazovskim, niestety nie pamiętam dokładnie. Wszechświat, kosmos, nieustannie rosnąca entropia wszystkiego co nas otacza. Wyobrażnia jest ważniejsza od wiedzy, ponieważ wiedza jest ograniczona.